I had heard about the “Camino family” phenomenon you become close with fellow travellers very quickly (ie. the Martin Sheen Camino movie). I didn’t think it would apply to me. But I also found myself tearing up when my time came to leave. Something the movie got right! Lots of people follow the Brierley Bible. I ordered the most popular English guidebook, A Pilgrim’s Guide to the Camino by John Brierley. The book breaks down the entire Camino Frances into 33 stages, to represent the 33 years Jesus was alive. Each stage is 20-40km long. Since I don’t care for Jesus or walking 40km in one day, I thought I would just stop wherever I wanted and walk as far as I wanted to. I quickly realized this was a ticket towards solitude, at least in late spring. Most people, especially English speaking people, were following the Brierley Bible to the letter. Inside one of the less frequented albergues. I spent two nights at tiny, but beautiful albergues in towns that weren’t scheduled stops. The second night, after hiking alone all day I was feeling lonely. I feared I wouldn’t find anyone to have a conversation with that day, as everyone was speaking German. Thankfully, two German speaking people ended up being expats from America and we had a lovely dinner together! Then the next day I got up at 5am and hiked until I caught up with the crowd just having their breakfast. I stayed on the guidebook until the end. Many people ship their bags ahead. I had no idea how so many people were making it just carrying little bags. I was in awe of their awesome minimalist packing. But then I learned most of them had GIANT bags waiting for them at their private albergues. It was a good lesson in not comparing myself to others. Your smart phone is your friend. You should be in the moment a lot of the time, but sometimes … it’s just time to listen to a Game of Thrones recap podcast. Also the Camino Pilgrim app (Android only) is amazing. Offline maps with GPS, customized route planning, guides to what is in each town. Amazing. You can check out beautiful sights like the Burgos Cathedral on rest days. I am a fit, active young person. I am used to reading guidebooks and being far above average. So I figured I would not need to plan for slow days or rest days, those were for other people. But I quickly learned my fellow pilgrims are fit people. And walking every single day for a month is really quite a serious physical challenge. Better to plan for rest days and not take them, then need them and feel stressed about your schedule. Take your pack out for a test walk before you go. If I had even taken it for a walk around the block, let alone for an hour stroll in a park, I think I could have saved myself throwing a lot of things away after I got on the trail. Everyone is doing this a bit differently. Your way is OK. It seemed like the greyer your hair, the greater chance you would 1) not be limping and 2) be in a great mood. When I talked this over with my fellow non-retired pilgrims, our hypothesis was that older folks had more physical and mental toughness. And also that they probably just felt less pressure to do whatever everyone else was doing. So I ended up after my first of four weeks not being able to walk. I could not bend my knee and putting any weight on my leg resulting in sharp shooting pain. It was an entirely new injury, so I had no idea how long it would take to heal. I sought advice from my family, friends and the 9,000 people in the American Pilgrims on the Camino Facebook group. (There is sadly no Canadian Facebook group.) I went to the hospital and got advice, ice, extra strength pain killers and a note that I used to stay extra days in albergues and later sent to my travel insurance. 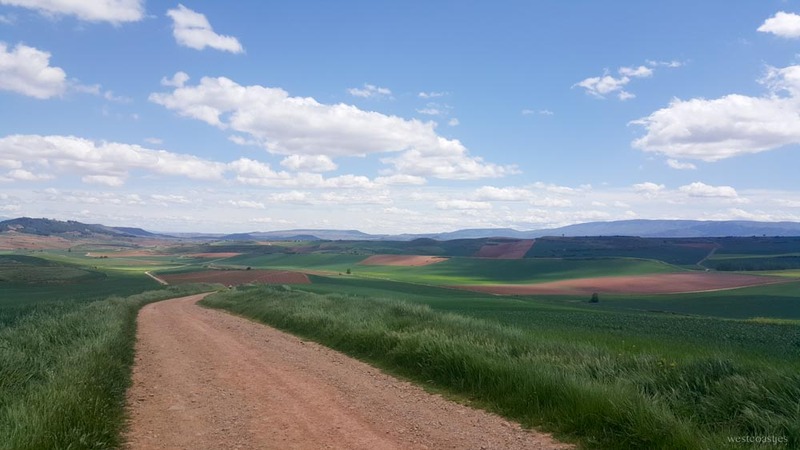 I ended up resting for three wonderful days in Burgos and then busing ahead to Leon to see if I could keep walking. After those four rest days, I still could not walk. I called my travel insurance, rebooked my flight and headed home early. Although it was a hard decision, it was the right one for me. I couldn’t walk for weeks. With physio, it’s really improved but still causing me problems. There is no way I should have kept walking. Which is OK. It gives me an excuse to try again! Awesome post. As one of those gray haired people, this gives me hope for my camino next year. Thank you for writing this. Tonight I had to make that very tough decision to stop and go home. I went to the clinic and took several days rest and bussed ahead. Then I walked for a few days and got very ill. I haven’t come out of my room for two days. I think I my rheumatoid arthritis is flaring up and I may have had bad water/food. Reading this tonight was exactly what I needed. Thank you! I’m so glad it was helpful. I felt really sad and lonely when I was resting at times and it was a hard decision to stop. But the Camino has been there quite a long time, it’s not going anywhere!! There is always a next time. Take care. I am a member of the Canadian Camino group, I got my cedential from them. I just meant there was no Canadian FB group where everyone can post. (A FB page is very differnet, as just the admind posts are seen.) But thanks for listing the resources!